Deep South Dish: Garlic Chicken from Birds Eye Voila! Authoring a full time food blog, I don't buy a lot of frozen food products, but as you know, they are handy to have for a hurry up meal. I love opportunities to try them though and to share my opinion with readers, many of whom do live a much more harried life than me. Based on the crowd in the frozen food aisle the day I purchased this, I'd say a lot of us are super busy these days and looking for food that is both convenient and satisfying. Birds Eye has always had good quality frozen vegetables, but now they've moved into a line of complete frozen dinners, and through the Foodbuzz Tastemaker Program I recently had the opportunity to give Birds Eye Voila! complete meal kits a taste test. I decided to try tried the Garlic Chicken. Soon as you open the bag, you smell the garlic and this gal loves her garlic so that made me happy! While these meal kits are probably best made on the stovetop, in a skillet, where you can control the heat, I was feeling particularly lazy this day, so I heated it up in the microwave. Dump it in a bowl, cover, cook, stir, cook, stir, serve. How easy is that? Just keep in mind that when cooking a meal such as this in a microwave, you should know how your microwave performs, considering that all microwaves will cook differently. Overcooking will give you a gummy pasta and a chewy protein no matter the product - don't want that! This is what it looks like coming right out of the package. A nice amount of vegetables - for the garlic chicken that includes broccoli, corn, and carrots. There's also a rotini pasta included as well as some seasoned, grilled white chicken - I would have liked to have seen a bit more chicken personally. If you look closely, you'll see that the sauce is mostly concentrated on the pasta, and then apparently quick frozen. The veggies and chicken each are showcased on their own, rather than being as heavily sauced. The chicken breast is seasoned with garlic, onion, Romano cheese, paprika and other seasonings, and is then grilled and cut into bite sized pieces. There are 11 grams of protein per serving. To cook, put in a lidded skillet, add 1/4 cup of water and cook on high simmer; stir, reduce to medium, cover and cook about 7 to 9 minutes. In the microwave, dump in a large bowl, cover, 5 minutes on high, stir, cover, go about 5 more minutes longer, stir and serve. 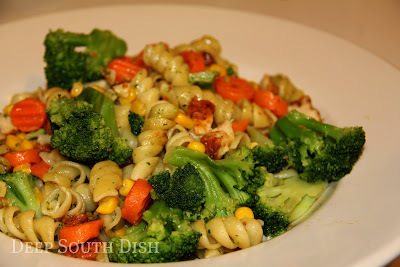 The sauce, made from a cream base containing parsley, garlic powder, and other seasonings, was very tasty, the pasta was firm with the right bite and well coated with the sauce, the veggies were fresh and crisp tender, and the chicken was well seasoned and tender - again, with the microwave, take care not to overcook, or for the best results, use the skillet method. As always with any packaged product sodium could be an issue if you are on a restricted diet. Nutritionally, serving size is stated as 1 cup cooked, and the sodium per serving is 540mg. The regular size states that it contains 3-1/2 servings but I'd say based on appetite versus actual nutritional guidelines, it'd be more like 2 servings to me, which, since my husband is not a big veggie eater, is how I ate it. That makes it a pretty good meal for one or two, especially if served with a side of bread, and maybe a nice garden salad starter. If you don't serve sides, this may not be enough of a meal for two. There is a family size kit available in several of the flavors, including the garlic chicken I tried. I consumed this for lunch and dinner on a day where I was on my own for meals and with nobody else to feed. To be honest I was in a mood for vegetables that day, and this really was delicious and hit the spot. Not only would I purchase this again, I have a taste for it again. It was really good! The regular sized Garlic Chicken retailed for $3.98 at this writing - so be sure to "like" Birds Eye Vegetables on Facebook to keep up with updates and to find out when coupons are available to save you some bucks too! Disclosure: I received free product from Birds Eye Voila! though the Foodbuzz Tastemaker program. We love that around here. I picked up a family sized bag and the three of us cleaned it up, that's for sure. A little extra garlic salt and some shaved parmesan amped it up a bit. My son told me about these meals and he was spot on.They are very good. As you said, add a salad and garlic bread and it is dinner for two. I, too, would like a little more chicken but over all a great meal for the money. I bought this a couple of weeks ago, My husband and I loved it. Great garlic taste then we also had garlic bread with it. Two thumbs up for this one quick, easy and delicious! I also serve these at my house and my husband and I share one. Best thing, Birds Eye is very often a BOGO (buy one get one free) at our local market. They sell like hotcakes and still very reasonable to the pocketbook! Great product.